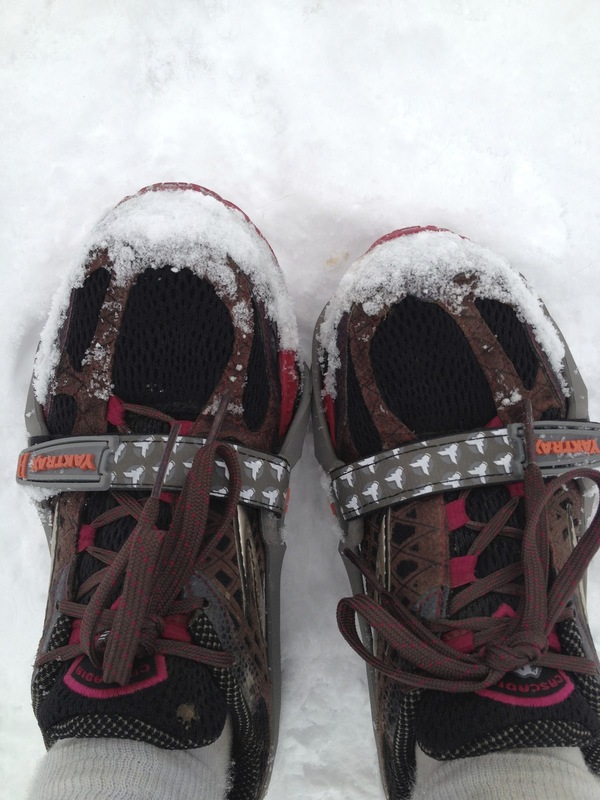 Serious Case of the Runs: Gaining Traction: A Yaktrax Review and GIVEAWAY! 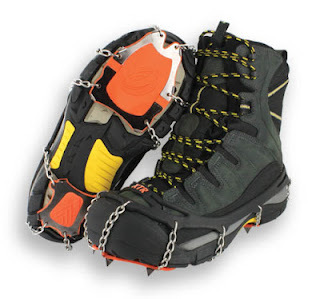 But, alas, you remembered to pack your trusty Yaktrax XTR Xtreme Outdoor Traction spikes! SWEET! Fear no more, fear no more. Ice, kiss it! You've got a summit to bag! So basically I have this intense fear of ice, and slippage on said ice, as a result of many a run along the Chicago Lakefront in winter...breeding grounds for some of the worst ice I have ever experienced. Ever. Gives me chills just thinking about it. And, since we now live in a place that can be a bit of an ice fest half the year (up in the mountains), I decided to look into taking control of my fear and getting some traction so that I wouldn't have to miss out on precious mountain time during the winter. 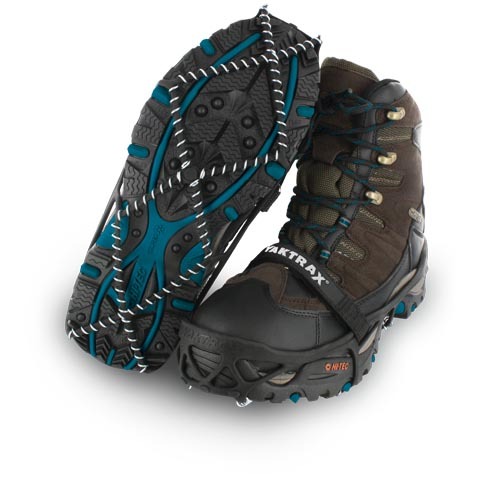 On a whim, I checked out Yaktrax's website to see if they had anything new, and lo and behold: the Yaktrax Run and Yaktrax XTRs appeared before my eyes. They've been busy making cool stuff! I've owned the Yaktrax Pros for awhile now, and my brother even sent me a new pair for Christmas this year, so I'm well versed on the Pros. I'm a big fan of the brand, and I'm a big fan of staying upright and being able to run no matter the weather. I was crazy-stoked to try out the Runs and the XTRs (hehe, the "runs" :)). I think everyone knows about the Yaktrax Pros, they are the original Yaktrax, with a velcro strap that goes over the top of your foot for added hold on the shoe. They are what I picture when I think of traction. 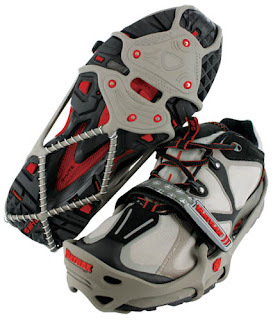 And, they are perfect for hiking in a little bit of snow, not totally solid ice, and for general use (e.g. walking the dog, shoveling, walking to the bus, etc.). They are the perfect daily use traction device, and sure beat turning all your shoes into screw shoes (which are fun to have, but not ideal). I have run in my Yaktrax Pros on occasion and they do a fine job in a pinch, they just feel a bit bulky underfoot if there's not enough snow (your foot doesn't go flush with the ground, so it feels a bit...pillowy), and snow gets stuck in the tread and coils. There's a happy medium in there somewhere, but likely not for the avid runner. Now, the Yaktrax Run. This was something new to me. I was curious about how they would stand up to the snow, and I admit, I didn't have very high expectations for them. I was really psyched about the XTRs, but wanted to give these a fair shake, too. They turned out to be pretty...okay! They would be perfect back in the midwest, where there is not a whole lot of snow these days, but a lot of crummy icey/snowy/slushy stuff that freezes overnight and makes morning runs a little scary at times. The carbide steel spikes on the Runs are fairly shallow and worked fantastically on the thin snice (snow-ice) I ran in along the Bonneville Shoreline Trail here in SLC. The conditions were great for these, but their use remains optimal in low snow or thin ice, and much more reliable than the Pros for sure. 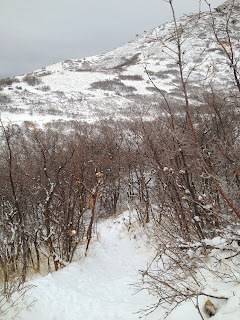 I felt like I had really good traction on the slippery stuff along the trail and I felt confident with each step. The Yaktrax Runs are the best replacement for screw shoes, and you can put them on any pair of running shoes without putting holes in your soles. I just busted a rhyme without even 'try'n. Okay, so, downsides? Probably user error, but the front lip kept slipping off and sliding underfoot. I had to readjust this a few times. And they were fairly tough to get on my shoes initially. Also of note, snow got stuck in the heel treads of my shoes and the rear coils of the Runs. The forefoot remained snow-free, but not the rear of the device. I kept having to knock the snow off my shoes to get better traction. I think the snow was wetter than usual (it was beginning to melt) so perhaps that added to how much it was packing beneath my feet. Nevertheless, I made it through fully upright and happy! Hard to tell in this photo, but the front lip of the Yaktrax Runs kept slipping off my shoe. And I'm saving the best for last. I can't help it; I'm completely partial, and for good reason! The Yaktrax XTRs are a godsend for mountain trail runners. Nothing short of that. I LOVE MY YAKTRAX XTRs! They are a steal of a deal at $50 at REI and they come with a handy storage bag that doesn't rip. The other big brand of spikes sells theirs for $10 more than the XTRs and the bag is sold separately, for another $10. That's a lot of dough. Anywho, 'nuff of that. Let's get to the goods! I stowed my XTRs, in the storage bag, in the back pocket of my Nathan vest on a recent summit of Mt. Wire here in SLC. Geof and I weren't sure what the conditions would be like, but I had a feeling (and hope!) ice would be involved. And I was right. Geof slipped and slid all over the trail, giving me a heart attack on several occasions, not to mention scaring the bejeezus out of himself a few times as well. The footing was terrible, and it got worse the steeper the trail got. After a few near misses, I stopped, pulled out my XTRs, slid them on (so easy, so quick!!) and continued onward. Geof was a little jealous. I was a kid in a candy store! Smiling, laughing; I couldn't believe how much better the running was with spikes! I couldn't believe what a difference they made. I had high hopes, and they were exceeded. I haven't felt that sure of foot in...ever. So, yea, the XTRs worked out pretty well for me. Once we began to descend, and the sun had had a chance to melt some of the snow and ice down lower, we were traipsing through a muddy, slushy mess, but I kept the spikes on just to see how they'd hold up and they did awesome! It was a little like nails on a chalkboard when I'd step on rocks with the spikes on, but they held firm and sturdy. Also of note, while the weight was apparent, that was the only thing giving away their presence on my feet. Since the spikes dig into the terrain, there's no weird wobbly feeling (like in the Pros). Your foot goes flush with the terrain with each step, just as it would in your shoes alone. Awesome. The toe and heel plates prevent snow from packing/sticking underfoot, and they actually work. When I was done, I slipped them off, stuffed them back in their sack and stowed them back in my pack. Easy peasy! I couldn't wait to use them again. Dare I say I look forward to icey runs on the trails now? I carried them in my jacket pocket this past weekend on a long run that included an ascent of Mt. Wire again; though I didn't need them I felt good knowing I had them just in case. Look, no snow stuck on the forefoot or heel! In closing, yes, I have a serious crush on my XTR spikes. They are a perfect fit for me and for the running I do, and for where I live. But, the Yaktrax Pros and Yaktrax Runs also have their place in my running/hiking repertoire. They will all get plenty of use in the miles to come. Soooooo, now that you've made it through this long-winded post, I have a treat for you! I'm giving away three pairs of Yaktrax! All you need to do is be a follower of my blog (it's easy, follow via Google Friend Connect in the right side-bar, or sign up to receive posts via e-mail, also in the right side-bar), then leave a comment below stating your name, how you would use a pair of Yaktrax, and which pair you think would suit you best (Pros, Runs, or XTRs). I'll give it a week or so, then select three random winners. Also, be sure to like Yaktrax on Facebook, and follow via Twitter (@yaktrax)! Man, I'm so excited to get this posted; it's been a long time coming! The PROS would work great on the winter roads and trails around Bozeman, MT. Based on your review, I think the Runs would suit me the best (can't say I've ever said that before!). I live in Wisconsin, where I often run in areas that seem clear but really have patchy ice. I'd use them for running outdoors more frequently in iffy conditions. I follow the blog via RSS. I'd pick the XTR for mountain running, specifically running up Mt. Si in North Bend, WA. first. I've only run it without spikes / traction devices and that was pretty tough. I would choose the XTR spikes! I would use them on my runs through the lovely rolling hills of Wisconsin. The influx of temperatures here these last few winters tend to leave our trails an icy mess and I've slipped more than a few times on my runs. I think the spikes would be a great way to combat that! I WANT THE RUNS! (Never said before and will never say again!) Would be perfect for avoiding the treadmills for me this winter and not being so scared of the patchy ice. I would choose a pair of the XTR's for mountain running on the Massanutten trails. It can get pretty scary during the winter on all those rocks and I'm training for MMT 100! I follow you on GFC(kellyr78) and I would like the XTR's for when I take my 3 mile walks around our local lake. It gets snowy & icey and I almost fell several times. Thank you! I just got a pair of Pros, and have used them several times. Work great on full snow trails, but like you say, if there is not enough snow they are sorta bulky underfoot. I'd love to try the XTRs. I live at 9,000' feet in the Colorado Rockies and could use these on all of the trails - they seem like they would be better for the conditions around here. PS: I follow via your RSS feed. Hey Paige, my name is Patrick and I would use the pro's for the midwest ice storms. I have the Pro's which I use sometimes on icy pavement, but they don't hold up very well. I have Kahtoola mini spikes that I wear off road most days in the winter, but I haven't tried the Yaktrax Run, do you think they would work on ice/light snow on pavement? Haven't seen the Run in any stores here, but would love to try them! I agree with your reviews! I bought a pair of Yaktrax Pros at the last moment before a snowy race, but the store only had Large. Although they worked very well, I had to keep re-adjusting them. Will look for a better fitting pair when the need arises again. 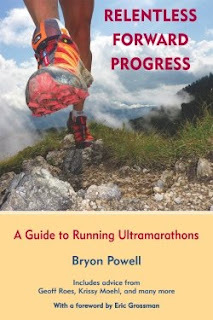 I am an avid trail runner from British Columbia, Canada. Our trails are packed with snow and ice and I would love a pair of the Yak Trax XTR's to keep me upright. My new love is trail running at night,with my headlamp, black Labrador, and my two teenage kids. They are slowly growing to love it as much as me. Gotta keep running exciting for the teens! Running at night, seeing the occasional deer, and hoping not to see anything bigger, these make great memories. Thank you for reading, Claire! Unfortunately this contest closed awhile ago. The XTRs sound like they would be perfect for your trails, too. Enjoy the glorious running!